Johnson Furniture Co. dry kiln at the rear of the factory. 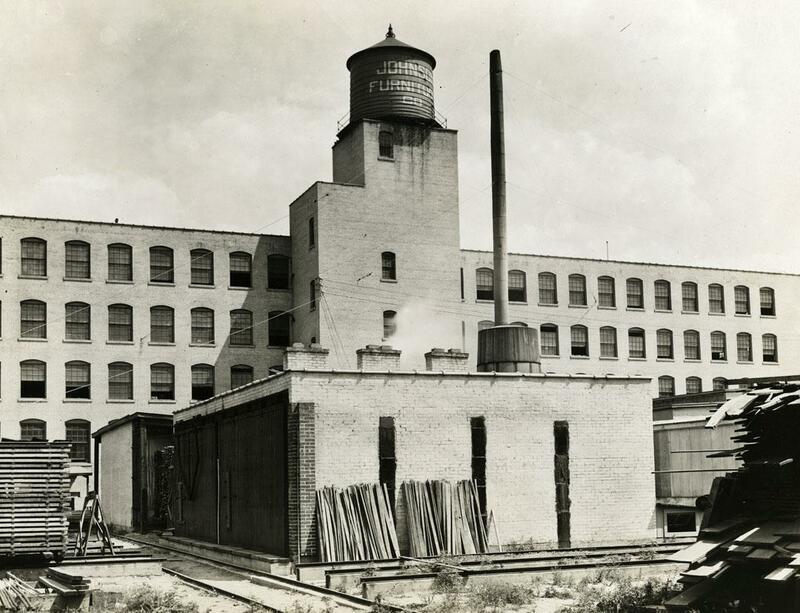 Successor to Cabinetmakers Co.; Predecessor to RoseJohnson, Inc.
1903: Johnson brothers begin Cabinetmakers Co.
1908: Cabinetmakers Co. sold; Johnson brothers begin Johnson Furniture Co.; Tom Handley hired as staff designer. 1913: Company completes a new factory at 1101 Godfrey Avenue SW.
1922: Johnson-Handley-Johnson organized as a companion company, utilizing the same factory, showrooms, and officers as Johnson Furniture co.; plant expands to include former Grand Rapids Piano Case factory next door. 1942 – 1945: Johnson plant converts to wartime production of part for Stinson Bomber aircraft. 1963: Last Johnson family member retires and company is sold; company merges with Timber-Line, Inc., while retaining Johnson name. 1968: Purchased by Holiday Inns of America, Inc.
1983: Merges with Rose Manufacturing Co. to become RoseJohnson, Inc.
Johnson Furniture was founded by three brothers who emigrated from Sweden in 1887: Carl (who had received a medal for his cabinetmaking skills from the King of Sweden), Hjalmar, and Axel. Tom Handley, who got his start at the prestigious firm of Waring and Gillow in London, became their in-house designer in 1908 and joined them as an officer in 1922. He continued to hold both positions until his untimely death in 1926. Handley established Johnson and Johnson-Handley-Johnson as major producers of high-quality, period revival, residential furniture. The nature of Handley’s designs required the skills of hand craftsmen like Bohemian-born carver Joseph Heyda, and Austrian-born Frank Davidhazy, Sr., who created the floral, figural and classical designs that were painted on the surfaces of some case pieces. David Robertson Smith, designer of Stickley Brothers Arts and Crafts lines, led Johnson into the production of Art Deco and Modern lines in 1928. The company later claimed that this was the first complete line of “modern” furniture produced in the United States. Lorenzo (Renzo) Rutili served as head of design from 1933 into the 1960s. He personally designed groups in the Modern and Neoclassical repertoires, and oversaw the contracted design of lines by a “Who’s Who” of famous Modern designers, including Paul Frankl, Eliel Saarinen, and J.Robert F. Swanson and Pipsam Swanson. When Earl Johnson retired and the family sold the company in 1963, it was purchased by a group of investors led by James Van Oosten. Milo Baugham and Kipp Stewart designed lines of residential furniture, which Johnson produced for Directional Industries between 1963 and 1968. After being owned by Holiday Inns, Inc. between 1968 and 1975, the company returned to the ownership of Van Oosten and company. Generally speaking, Johnson produced wood residential furniture for the bedroom, while the Johnson-Handley-Johnson label was used to dining suites, occasional tables, and case pieces for the hall and library. Pieces produced between 1908 and about 1920 were designed in period revival styles, especially Sheraton, Hepplewhite, and Empire, and in a combination of European and American Revivals including Colonial, William and Mary, Jacobean, Queen Anne, French Provincial, Chinese Chippendale, and painted Italian or Venetian, from circa 1920 to 1935. Most notable are pieces designed by Tom Handley, which feature intricate marquetry designs and elaborate carving. Some of his most unusual designs are adaptation of classical Egyptian furniture, introduced in the early 1920s to capitalize upon popular fascination with contemporary archeological discoveries. The 1928 introduction of the Art Deco “Dynamique” line by D. Robertson Smith, with its exotic wood veneers and forms reminiscent of Frankl’s “skyscraper” bookcases, began a long period in which the company concurrently produced both modern and revival lines. Renzo Rutili selected traditional master works from museum collections across the country for reproduction in the 1938 American Museum Group. A sharp contrast to these reproductions came only a year later, when Johnson introduced a modular system for the home known as “Flexible Home Arrangement” (FHA), designed by Eliel Saarinen and J. Robert F. Swanson and Pipsan Swanson of the Cranbrook Academy of Art. In the early 1950s Johnson produced several line by Paul Frankl, among them the “Contemporary” line, made from pearwood with bleached cork counter tops, and chairs with “plunging neckline” cutout backs that mimicked women’s fashions of the day. New lines referencing historical styles were also introduced in the 1950s and early 1960s, including the “Country Directoire,” “Mediterranean,” and “Riviera” lines designed by John Wisner. In 1963 Johnson began to produce television and stereo cabinets and juke boxes on contract. 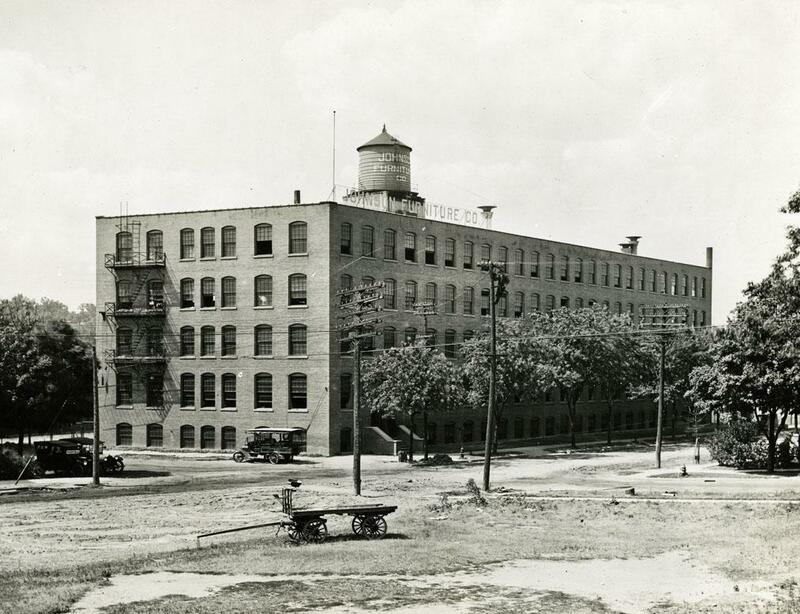 Johnson also became the sole manufacturer of case goods and occasional furniture for Directional Industries. After Johnson merged with Timberline, Inc. it added furniture for hotels, motels, and college dormitories to its contract lines. John produced and installed furniture in dormitories of many major state and private universities under the name “Uniline” as a subsidiary of Holiday Inn. Its hotel and motel furnishings were installed in most Holiday Inns and many Howard Johnson motels worldwide, and in special projects such as the Aladdin Hotel in Las Vegas. The Grand Rapids Public Museum has in its collections a large number of Johnson catalogs, original design drawings, and other archival materials ranging from the 1910s through the 1970s, as well as a good representation of its products from the same range of dates. Both Johnson and Johnson-Handley-Johnson used the same symbol as their logo: three teardrops spiraling around a common center, a sort of three-part yin and yang. This symbol commonly appears as a metal tag inside the right-hand drawer of case pieces, or on a paper label affixed to the back of a case piece or under the seat of a chair. Some paper labels between 1908 and circa 1930 also include a box with the printed signature “T.S. Handley”. In the 1960s the company name was printed in uppercase serif letters, with a crown resting on the “J”. During the late 1960s and early 1970s the trademark was a bold “J” over a small red dot. Manufacturer of tables and library suites. Predecessor to Johnson Furniture Co.